One smiley face made of Post-it notes turned into a conversation between the occupants of two Rosslyn office buildings in this week. Allison Krumsiek, a government contractor, said her office has considered making contact with the office across the street — the new CEB office tower at Central Place — ever since people began moving into the space a few weeks ago. Before the new office moved in, Krumsiek said she and her coworkers had a straight-on view of construction workers putting the building together. 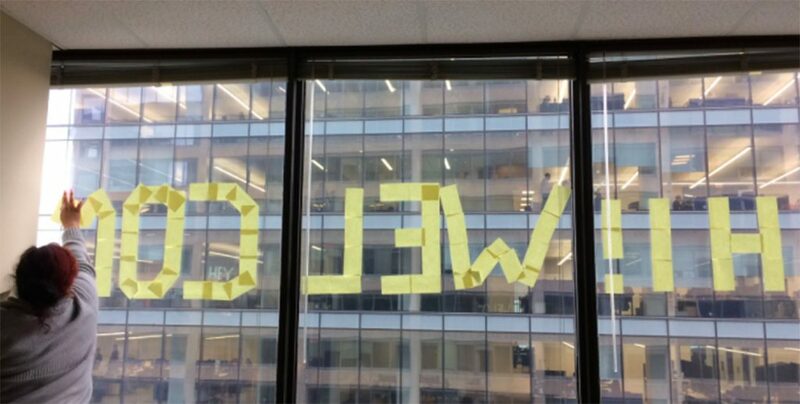 Then on Monday, people in the new office placed a Post-it smiley face on their window, and the intra-office communication was on. “So we thought time was perfect to respond! We put up the ‘Hi!’ And when another floor of their building responded with ‘Hey’, we added ‘Welcome! '” wrote Krumsiek in an email. “As you can tell from the picture, they had to use at least 3 colors of Post-it. Those things last forever when on your desk but go in a heartbeat when sending messages on windows,” Krumsiek added.